Deputy Secretary General of the United Nations Amina J. Mohamed opened the UN Economic and Social Council (ECOSOC) Partnership Forum with a reminder to Forum participants that “we are all development actors.” The 2019 Forum, held at the UN headquarters in New York, convened representatives from governments, across the UN system, NGOs and business to share experiences on how to design and promote successful effective partnerships and how partnerships can advance the 2030 Sustainable Development Agenda and its 17 SDGs. Norine Kennedy, who leads USCIB work on strategic international engagement, energy and environment, spoke on behalf of the International Organization of Employers (IOE), to draw attention to the importance of pursuing open, transparent and inclusive business involvement in informing and advancing UN outcomes and initiatives. “In light of the substantial challenges ahead in the UN 2030 Agenda for Sustainable Development, we should open the doors wide to partnership with the private sector,” stated Kennedy. The Partnership Forum is part of the annual round of UN 2030 Agenda related meetings leading up to the UN High Level Political Forum (HLPF). While the HLPF holds deliberations on clusters of SDGs year by year, SDG 17 on partnerships is reviewed every year. Framed as a goal to “Strengthen the means of implementation and revitalize the Global Partnership for Sustainable Development,” SDG17 is being re-interpreted to emphasize partnerships with the full variety of non-governmental actors, including the private sector. As the International Labor Organization celebrates its one-hundredth anniversary this year, the United Nations commemorated this milestone at the UN General Assembly on April 10 under the theme “The Future of Work.” The commemorative plenary was attended by heads of state, ministers, heads of delegations from permanent missions to the UN, and representatives from the private sector, including USCIB President and CEO Peter Robinson. Opening statements were made by President of the 73rd Session of the General Assembly María Fernanda Espinosa Garcés, Secretary General of the UN António Guterres, Director General of the International Labor Organization Guy Ryder, President of the International Organization of Employers (IOE) Erol Kiresepi, and others. As IOE Vice President for North America, Robinson also took part in a luncheon, co-hosted by Espinosa Garcés and Ryder, to discuss progress, good practices, and lessons learned toward achieving the eight Sustainable Development Goal (decent work and economic growth). The luncheon provided an opportunity for participants to take stock of the progress in the implementation of sustainable development objectives in the area of promoting sustained, inclusive and sustainable economic growth, full and productive employment and decent work for all. According to Robinson, the luncheon provided a terrific opportunity to support the ILO as an example of inclusive multilateralism embodied in its tripartite structure. “We at USCIB are proud to celebrate the ILO’s centennial, alongside our partners in the Department of Labor, the AFL-CIO and the International Organization of Employers’ worldwide membership,” said Robinson. 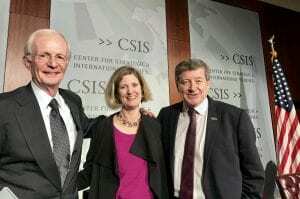 Ed Potter, who serves as Counsel for USCIB, took part in a high-profile discussion on April 12 hosted by the Center for Strategic and International Studies (CSIS). 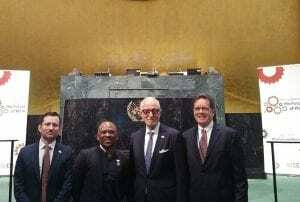 The discussion was part of a broader set of meetings in 2019 celebrating the 100-year anniversary of the International Labor Organization (ILO). The event last week, entitled “Shaping the World of Work: U.S. Engagement with the ILO,” focused on the instrumental role of U.S. Secretary of Labor Frances Perkins in leading the United States to join its first multilateral institution in 1934 – the ILO. The event also featured U.S. Secretary of Labor Alexander Acosta, Director-General of the ILO Guy Ryder, Director of the International Department of the AFL-CIO Cathy Feingold, and author of “The Woman Behind the New Deal,” Kristin Downey. Panelists reflected not only on the ILO’s history and achievements, but also looked ahead towards the ILO’s next hundred years and the role the ILO can play in addressing future priorities. Reflecting on the ILO’s unique governance structure in which governments, employers and workers all must come together for consensus decision-making, Potter stressed, “You can not underestimate the strength of the tripartite system that holds the ship together.” In terms of key milestones from a U.S. employer’s perspective, Potter cited the ILO’s 1944 Declaration of Philadelphia and the 1998 ILO Declaration on Fundamental Principles and Rights at Work as formative frameworks which are all the more relevant today – especially as the ILO looks towards its next century. This upcoming June, some 6,000 ILO tripartite constituents will come together again at the ILO International Labor Conference to negotiate, among other items, a new ILO declaration focusing in broad strokes on its next 100 years. “USCIB will participate actively again, representing U.S. employers, constructively engaging, and playing a key role in these critical deliberations to steer the ILO “ship” towards the next century,” said Gabriella Rigg Herzog, who leads USCIB’s work on labor policy. USCIB Vice President, Corporate Responsibility and Labor Affairs, Gabriella Rigg Herzog took part in informal consultations on March 14-15 at the International Labor Organization (ILO) on the proposed standard on violence and harassment in the workplace. Held in Geneva, the meeting was part of ongoing negotiations that may result in a new, legally binding labor standard on this important workplace issue. The aim of the informal consultation was to identify potential areas of consensus, particularly with regard to the definition of violence and harassment, the persons covered under the standard, the scope of the “world of work” and the inclusion of a list of groups disproportionately affected by violence and harassment. “While the discussions were informal, the group agreed to review the possible text revisions discussed and reflect upon them in the lead up to the final round of negotiations this June at the ILO’s 2019 International Labor Conference (ILC),” said Herzog. According to Herzog, given that 2019 marks the centenary anniversary of the ILO’s founding, the stakes will be especially high for the ILO and its tripartite constituents—government, employers and workers—to try to find agreement on a text this June. Reflecting on the negotiations to date, Herzog also noted, “We have an historic opportunity to combat violence and harassment in workplaces around the world via these deliberations. USCIB will continue to actively participate in the negotiations and work with other global employers to advocate for a meaningful, clear and inclusive text that advances workplace protections for everyone – including workers, public employers, private employers and LGBTI persons. 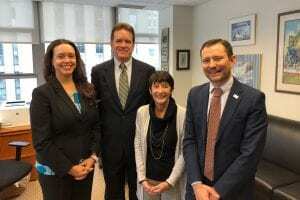 On March 1, Roberto Suarez Santos, secretary general of the International Organization of Employers (IOE), visited USCIB’s New York headquarters to discuss the group’s global priorities and evolution as it gets ready to mark its centennial next year. The IOE, based in Geneva, is part of USCIB’s global network and serves as the voice of the private sector on employment, labor and social affairs in the International Labor Organization (ILO), as well as a number of other multilateral bodies. Suarez Santos met with USCIB staff and members (with help from a video link to our Washington, DC office), led by USCIB President and CEO Peter Robinson, who serves on the IOE management board and as an IOE regional vice president for North America. The IOE secretary general outlined the organization’s recent growth, now up to 30 staff members, and its engagement beyond its traditional ILO role, especially in the area of sustainability, business and human rights, and broader responsible business conduct policy and practice. Suarez Santos also noted the IOE’s longstanding complaints against the government of Venezuela due to its harassment of the Venezuelan employers federation Fedecamaras, which has resulted in the creation of an ILO commission of inquiry – the ILO’s highest level investigative procedure. USCIB and its fellow IOE members remain concerned about the situation for employers in Venezuela and will follow this ILO procedure closely. Well-managed, migration is a vehicle for fulfilling personal aspirations, for balancing labor supply and demand, for sparking innovation, and for transferring and spreading skills. Unduly closing borders to migrants is detrimental to business needs at all skills levels. Thus, the overarching goal of the private sector is a regulatory environment in which labor migration policies support business development to create job opportunities and economic prosperity. The Global Forum on Migration and Development (GFMD) and UN Global Compact on Migration (GCM) Summit were held back-to-back in Marrakech, Morocco December 5-11. USCIB Senior Counsel Ronnie Goldberg represented USCIB and the International Organization of Employers (IOE) as part of the Business Mechanism to the GFMD at both meetings. The GFMD Business Mechanism was the primary vehicle through which the private sector contributed expertise and advised governments on aspects of labor migration policy pertaining to select provisions of the GCM, specifically those dealing with flexible pathways for regular migration, responsible recruitment and skills mobility and development. IOE President Erol Kiresepi was also active during the Summit, presenting Business Mechanism views and commitments during the Opening Session of the Summit. Goldberg participated in two side events: one as panelist on the Implementation of the GCM and another as moderator at a USCIB co-sponsored event Partnering with the Private Sector: The GCM and Business. The Partnering with the Private Sector side-event took place on December 8, co-organized by IOE and PMI, and highlighted the crucial role the private sector plays in ensuring safe and orderly migration. As such, side-event participants advocated for a transparent legal framework to support business environments conducive to economic growth and development. 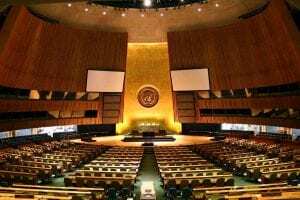 Proposed treaty would fundamentally shift the burden of policing and enforcing global human rights from governments onto multinational companies. Treaty is championed by Ecuador and several other governments, alongside a number of activist groups. This week in Geneva, at the fourth session of a UN working group charged with reviewing standards for companies with respect to human rights, the global business community has united in opposition to a proposed “zero draft” of a treaty on business and human rights. 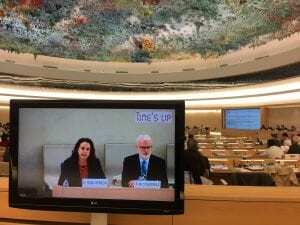 The proposed treaty, championed by Ecuador and several other governments, alongside a number of activist groups, would fundamentally shift the burden of policing and enforcing global human rights from governments onto multinational companies, according to Gabriella Rigg Herzog, USCIB’s vice president for corporate responsibility and labor affairs, who is attending the Geneva meeting. The zero draft includes requirements that are unclear and not aligned with recognized “soft-law” instruments such as the UN Guiding Principles on Business and Human Rights. It establishes a different set of requirements for transnational business activities versus other enterprises and organizations. Business representatives from numerous countries were on hand to prepare views and share good practices relating to employers and job creation in connection with the SDGs. “Businessfor2030 is really the perfect way to showcase what the business community is doing for the SDGs,” said Matthias Thorns of IOE. The Global Business Forum on the Sustainable Development Goals (SDGs) met in Madrid, Spain from October 1-2. Business representatives from numerous countries were on hand to prepare views and share good practices relating to employers and job creation in connection with the SDGs. USCIB Policy and Program Assistant Mia Lauter represented U.S. employers and USCIB at the session. The Forum, organized by the International Organisation of Employers (IOE) and hosted by Confederación Española de Organizaciones Empresariales (CEOE) with the support of the European Union, aimed to raise awareness of the SDGs and the contributions that businesses can make to their achievement and exchange experiences about the involvement of Employers’ Organizations (EOs) and discuss the role they can play. The Forum also sought to better understand the needs and expectations of companies – MNEs and SMEs alike – with regard to support from EOs, as well as learn about the challenges and opportunities arising from SDG reporting, see the SDGs in the larger context of UN reform. Finally the Forum aimed to define the key messages of business for the high-level review of SDG 8 in 2019; and identify key follow-up actions for the IOE and invited delegates. Be Inspired: Businessfor2030 aggregates companies’ sustainability initiatives and re-broadcasts them in alignment with the SDGs, then directly targets them at the audience that cares – the UN. Explore case studies of private sector contributions to sustainable development and the SDGs. Get Involved: Businessfor2030 provides resources to connect companies, UN agencies and governments for public-private partnerships for the SDGs. It also offers opportunities for companies to add their own examples of case studies or contribute stories and policy views through the Bizfor2030 blog. 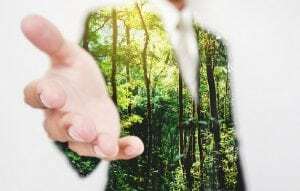 Lauter emphasized that achieving the SDGs calls for an all-of-society approach, and that Employers’ Organizations have the unique ability to connect the many stakeholders involved in social and economic aspects of sustainability. Director of Stakeholder Engagement at IOE Matthias Thorns agreed. “Businessfor2030 is really the perfect way to showcase what the business community is doing for the SDGs,” said Thorns. The Forum, which offered a global exchange among employers’ organizations on sustainable development, helped participants foster a better common understanding; learn from national experiences; identify areas of common concern; and agree on follow-up action, as well as facilitate public-private dialogue on the issue of business engagement on the SDGs. The Summer/Fall 2018 issue of USCIB’s quarterly International Business magazine is available here. 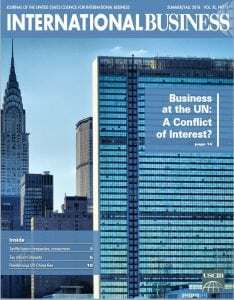 The issue features a timely column by USCIB President and CEO Peter Robinson titled, “The Myth of Private-Sector ‘Conflict of Interest’ at the UN. The issue also features news stories on how tariffs harm companies and consumers, tax reform impacts, and reinforcing US-China tie, plus news from our global network–Business at OECD, the International Organization of Employers and the International Chamber of Commerce. Forum brought together 200+ representatives from the private sector, U.S. government, civil society, academia, and international organizations to discuss the importance of partnerships in achieving business and human rights goals. What does and doesn’t work in partnerships? How business can work and interact with human rights defenders? Best practices and challenges for business in providing access to remedy? How to address the issue of wages in the supply chain? 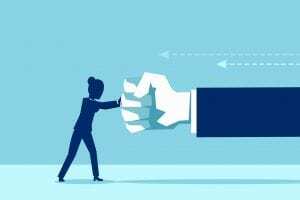 Understanding diversity and inclusion in the workplace? The keynote speaker at the event was Director-General of the International Labor Organization Guy Ryder. Other speakers included USCIB Vice President of Corporate Responsibility and Labor Affairs Gabriella Herzog, Director of Global Workplace Rights at The Coca-Cola Company Brent Wilton, Director of Stakeholder Engagement at IOE Matthias Thorns, and Michael Congiu of Littler Mendelson as the representative of the U.S. Chamber of Commerce. USCIB member company speakers included The Walt Disney Company, Walmart, H&M, and Rio Tinto. “Our role at USCIB is to support U.S. business in creating and supporting a more prosperous society, including through demonstrating respect for human rights in their activities,” said Herzog. “We’re proud to be a co-sponsor of this prestigious annual human rights event which provides sharing and learning opportunities about the important roles that governments, business and civil society representatives are playing to advance human rights around the world,” Herzog added. The event’s agenda is available here.